192 pages. 275x215mm. Printed on gloss art paper, casebound with printed board covers..The Caledonian Railway was something of a latecomer to the Edinburgh railway scene, but proved it was not backwards in extending its hold on the city and environs. Thwarted by the NBR in its attempts to access the docks at Leith and Granton, it pursued its own agenda in serving the burgeoning industries in both West and Midlothian. 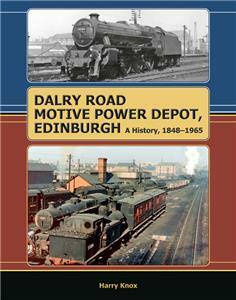 A passenger railway from the outset, a small ‘engine house’ was constructed in the Dalry Ward of the city, known as Dalry Road MPD, which eventually provided motive power for both the significant passenger train service, and the mineral and goods traffic being handled. It also provided power for an intensive suburban passenger service to the north and west of the city. The ‘Caley’ was to prove a much-loved institution in Edinburgh.